Unfortunately, one issue with using these is the look and feedback on errors and confirmation. The default styling is just ugly and the themes available are… well, not great. The only theme I liked is the ‘magazine’ theme which is clean and simple. But despite the decent look of the form itself – the confirmation page is stuck in google’s default blues and over overall styling. So I decided to go on the hunt for a better solution. Here follows my custom solution – taking lead from various sources (as listed below). 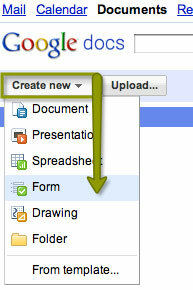 once you have accessed the google documents – you can create a new form by choosing it from the dropdown menu, as shown here. Note the spreadsheet option here – all data submitted to the form will be saved in the spreadsheet created automatically. You will not need to create this yourself – it will be done automatically as soon as your new form is setup and ready. Thought I have a hate for spreadsheets – I am coming around to seeing their potential here. All data is easily accessible in one place. once you clicked the ‘create new – form’ – you will be taken to a new window, ready to start putting your form together. There are 2 sample fields setup for you – the first one in editing mode, ready for you to customise. There are various form filed types available for you to select from and you can choose which fields are to be set as required information. Once you have completed your form – you can choose from the number of themes available for styling. You will have the options of previewing the themes before applying them to your form by simply clicking on the thumbnail image. The options are limited but are being added to over time. I would think that these are great for a quick and easy form used for any suitable purpose. The ease of use and application of the themes is excellent and do have their uses. There are a few nicely designed themes available by now but personally, I’m not too impressed overall. And as a designer creating a specific site – you will of course want to customise the design of the form to fit the site which will be covered in the following steps. click on the title to view the spreadsheet and to configure the necessary settings for data validation and notification. 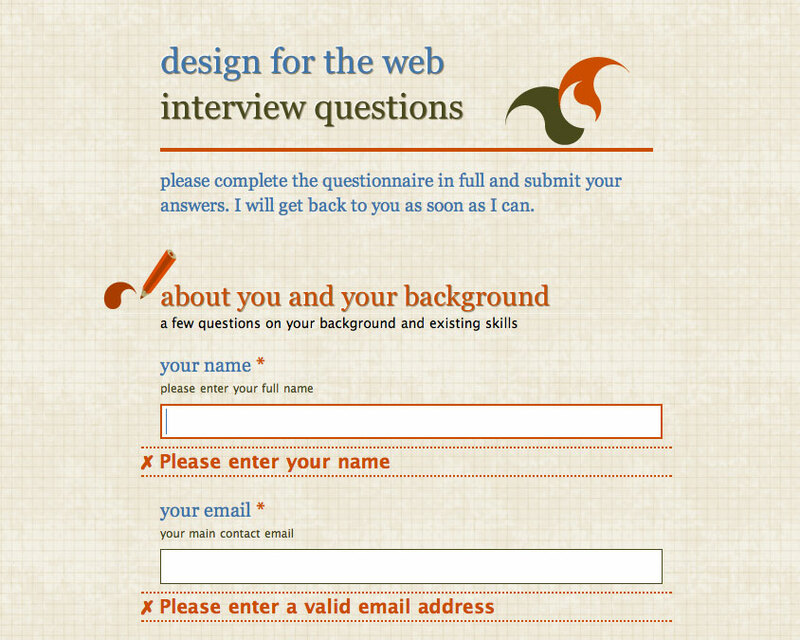 To get this form embedded into your site – there are several issues to consider. Google forms hosted on Google make use of all Google’s goodness in regards to security, processing and confirmation of form submission. You can simply leave the form where it is, hosted with Google – and use the embed option available to use it on your site. 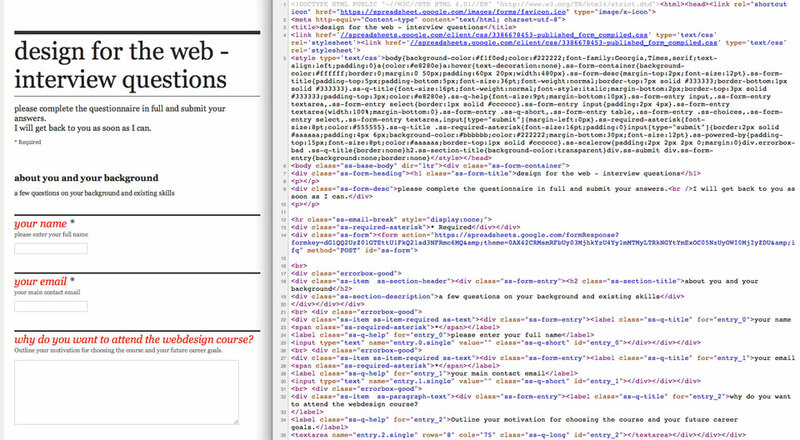 This option via the embed code will use an iFrame to show the form on your site, using the theme you applied. Though this is perfectly fine and works very well – you will not have access to the actual styling of your form – or be able to set up your own confirmation page (not as far as I can figure out anyway). get the final source code. view your completed form in the browser and get the source code. Paste the code into your webpage, making sure you take the entire form code. You can place the form into your main div or simply on the page itself, all other elements such as your menu, sidebar or footer can be added accordingly. You will notice that there is a lot of extras in the source code – not all of which you actually need, such as the embedded CSS or the favicon. Do make sure to make sure to check carefully that you take the code for the entire form and add in the link to your own CSS as required. redirecting to custom confirmation page. As Google from validation is embedded into the hosted solution only – you will need to add your own for your custom form. There is an excellent plugin for jQuery available which fits the purpose perfectly :) Download the jQuery plugin: Validation by Jörn Zaefferer and copy the ‘jquery.validate.js’ file into your site’s directory. Note the ID called ‘questionnaire’ here. You will need to add this ID to your form tag (replacing the existing ID found in the original code). As last step to validate the fields (in addition to checking for a properly formed email address) you will need to manually add in the class ‘required’ to your required fields. The email field needs to have an additional class of ’email’ for proper validation. Any error messages will use the title attribute, added to the input tag of the required form fields, as shown below. Finally, don’t forget to style your error messages to complete your styling and make your form look seemlessly integrated into your site.